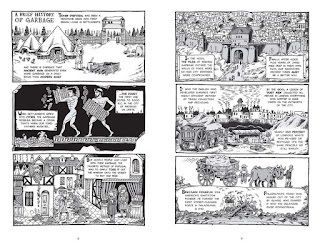 Derf Backderf got a ton of critical attention for his autobiographical comic that then grew into a graphic novel, "My Friend Dahmer," which discussed how he actually knew Jeffery Dahmer before the serial killing began. Derf has done other work before, and, "Trashed," is his revisiting and re-doing a smaller comic he did about his days as a garbage man but now as a full-length graphic novel. Released in 2015, "Trashed," is a mixture of storytelling and all-to-disturbing-real facts about how much garbage we as a populace create. As the comic often points out, we put out our garbage and feel like it magically disappears by the time we return home. Reality is of course far more complicated however. 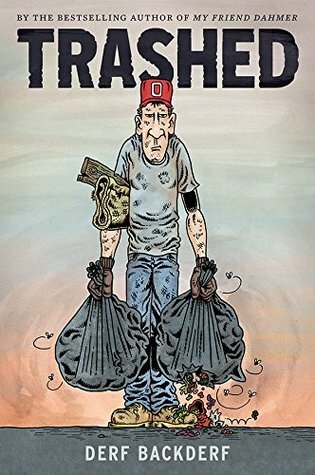 Throughout reading the copy of, "Trashed," I picked up at my local library I found myself moderately interested in the lives of the characters in the comic, but utterly fascinated by the facts about garbage in the world. Derf's illustrative abilities combined with his writing about garbage collection results in some startling pages of refuse-filled landscapes that look almost disgustingly beautiful. These otherwordly patches of land stacked to the brim with ton upon ton of junk are terrifying. The everyday lives of the main characters sadly aren't as gripping, if still intriguing enough to follow in-between the alarmingly scary facts about trash and recycling. Dirk. J.B., Bone, and everyone else get up to some interesting shenanigans, encountering all kinds of nasty foodstuffs, dead animals, and the occasional large appliance. Still, I almost wonder if instead of quite liking the book I could have loved it if Derf had gone more in the direction of just sharing the horrifying history and current events of garbage as opposed to also working in some vaguely-autobiographical-and-somewhat-fictional tales about his garbage collectors. 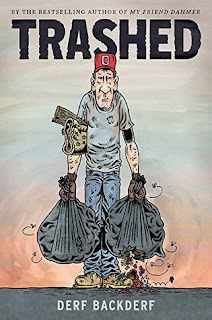 "Trashed," is a book that is at times fascinating and at other points a bit less impressive but still a good read. Fans of Derf's work will surely enjoy this, as well as anyone who has ever wondered just what happens to garbage after we put it out by the curb. Even if the book at times drags, it still is overall a very good read.